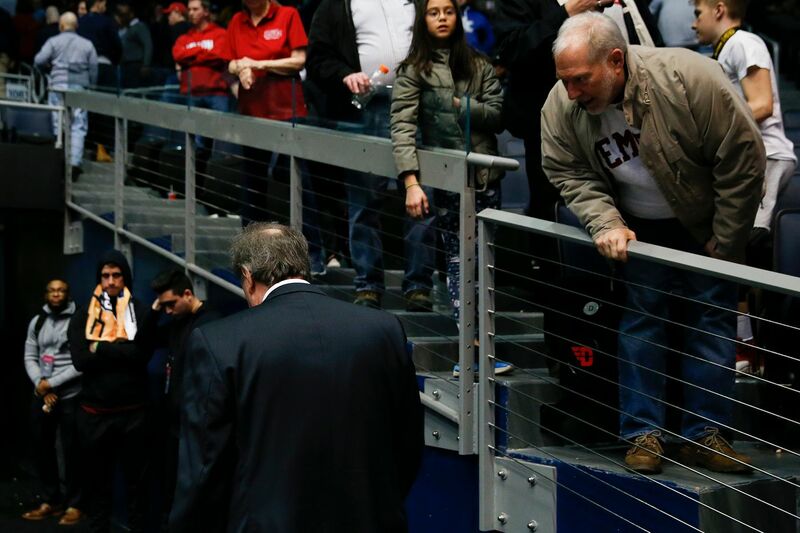 Fran Dunphy walks off the court past fans after the loss to Belmont. DAYTON, Ohio — At 11:36 p.m. Tuesday, Fran Dunphy walked out of his last locker room, to walk down a hallway inside the University of Dayton Arena to his last news conference. Owls senior Shizz Alston got out to the hallway first, then Nate Pierre-Louis, wearing a towel over his head. The emotions hung heavy. Pierre-Louis kind of collapsed onto Alston’s shoulder. They started walking, Dunphy right behind them, box score in his right hand, cheeks red. The Temple group was behind the curtain hearing the Belmont coach talk about how the Bruins expected to get to Jacksonville about 4 o’clock in the morning, the hotel by 5. That had been Temple’s plan, too. For the record, final score of Dunphy’s final Temple game: Belmont 81, Temple 70. Had it hit Dunphy yet that this was the end? Dunphy walks off the court after the loss to Belmont. His best defensive player couldn’t have done a better job of deflecting the question away from his emotions. Dunphy went on a little more about Belmont’s star forward and how Pierre-Louis did a terrific job on him, but the guy did nothing crazy, let the game come to him, stayed a critical piece to their game plan even though he wasn’t scoring. The questions returned to the game, about this run or that bit of foul trouble. About one big shot that Belmont hit, Dunphy said he thought Alston had been in good defensive position. “It would be nice to see on the film,’’ Dunphy said. News conference ended, Dunphy stopped on the ramp. He’d called Phil Martelli that morning. A day that ended with Dunphy’s last Temple game started with the news that Martelli had already coached his last St. Joe’s game. How does he feel about how he’s leaving things for Aaron McKie, who now takes over? Does he feel sad about leaving the coaching ranks? Whatever he can do for any of these guys, he said he’ll do. Anything he wants to do that he hasn’t done? Is he sure he is done coaching? Even his closest friends wonder about that one. “Does anybody out there ever say never?’’ Dunphy said. Was he really going to watch the film? “What else am I going to do?’’ Dunphy said.